Energy production has its own "law" of supply-and-demand: the power company must be able to supply enough energy to meet virtually any demand at any time. Because demand varies throughout the day and nobody wants to generate more than necessary, most power companies have peak power plants that fire up only when needed. Often these plants run on natural gas since natural gas generators can start up quickly. Natural gas, of course, is a fossil fuel - a non-renewable resource. Peak power plants are expensive to build and have a very long payback period. Renewable sources of energy like solar and wind can reduce the need for peak generating plants, if we could store the excess energy that they generate and use it later. Toronto Hydro, the University of Toronto, eCAMION Inc., and Dow Kokam LLC have joined forces to develop a Community Energy Storage (CES) system. 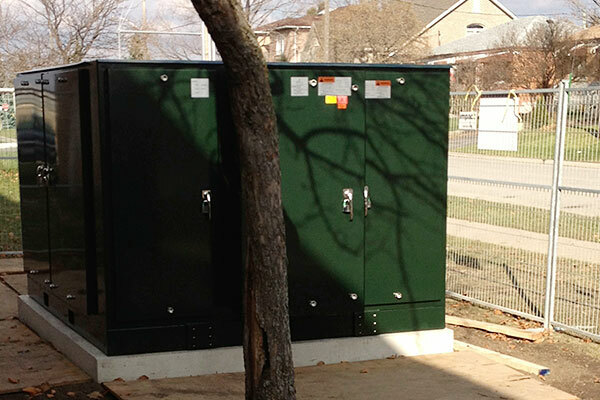 CES is composed of custom designed battery banks dispersed throughout Toronto neighborhoods. These battery banks store energy when supply exceeds demand and give it back when demand increases. They can also provide temporary emergency power during brief grid failures. CES relies on banks of Lithium-ion batteries, just like those you'd find in cell phones and laptop computers. Their high energy-to-size ratio makes Li-ion batteries a natural fit for neighborhood energy storage. A CES battery bank has 250kWh of capacity and fits on a small concrete pad. Li-ion batteries are a little picky about charging and discharging. If overcharged, they can catch on fire. Excessive discharging can reduce the batteries' life. Because of this, battery management systems (BMS) are used to control the charging and discharging of Li-ion batteries. In addition to charge/discharge control, a CES unit's computer interacts with the grid and make decisions about storing and releasing energy. Only a few CES units have been deployed in this pilot study, but officials expect to scale up the system in the near future.